As people advance in age they will experience different medical conditions that they have not experienced before. One of these can be a herniated disc. This is common among men who pass the 40 year mark and it can manifest in men as young as 30 years old. A disc herniation happens when the gelatinous material inside the disc leaks out and applies pressure on a nerve or on the spinal cord itself. This must be treated otherwise the patient will experience pain in his back as well as arms and legs. For the minor cases of a herniated disc, surgery is not necessary. A few days of rest with minimal physical effort can treat the most basic conditions. More serious ones can be treated with therapy and applying ice packs on the back to reduce the swelling. This can be accompanied by the use of anti-inflammatory drugs. However, there are plenty of cases where the pain reaches a critical level and surgery is needed. In these cases the goal is to create a decompression which will alleviate the pressure on the nerves and stop the pain. This is usually done with an open thoracotomy. An open thoracotomy is the best way to treat a central or centro-lateral herniated disc. This is done by reaching the disc through the chest cavity instead of the back. In medical terms, it is known as an anterior trans-thoracic approach. 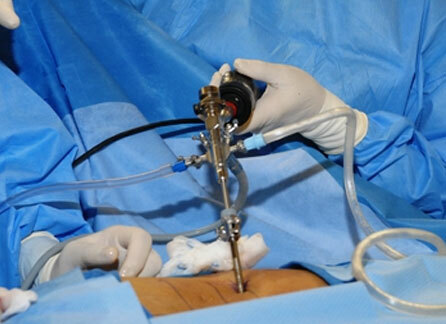 Nowadays, this procedure is done with the assistance of small cameras on the end of tubes. It is known as the VATS (video assisted thoracic surgery) procedure and it is very effective in creating smaller incisions while allowing for great accuracy. This, in turn, will mean a smaller recovery period for the patient. Once the surgeon has reached the disc he can cut off part of it, which will take all of the pressure off the spinal nerves or the spinal cord. In most cases, this procedure is covered by the NHS. However, those people that want to use a private clinic for the surgery can expect to pay around £15,000 for the procedure. This is the case at most reputable clinics. One of these should always be used since they employ professional and experienced surgeons. Good options for people who are looking to get a private surgeon to perform the disc decompression surgery include the London Bridge Hospital, the West London Spine Clinic, the Princess Grace Brain and Spine Centre, Spire Healthcare and the Ramsay Health Care Clinic. If you experience back pain there is no need to be alarmed. As mentioned previously, this is a common condition, especially among men of a certain age. The best thing to do is to try and reduce your physical activities for a period of time and resort to medication and therapy. If the problem persists then do not hesitate to consult a physician and schedule a surgical intervention.